SOIL EROSION AFTER A WILDFIRE- RESTORATION SAVINGS!! 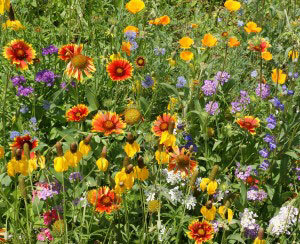 We have had many people contact us for control using Wildflower Seeds for their specific geographical area. We thought that we need to offer a reduced prices for these families, after all they are not just buying Wildflower Seeds as they want to naturalize a specific area in their yard or acreage, they are trying to save what ever they have left and not have any further damage. We have many types of seeds and some are not listed on our site, even using specific native grasses will help as well. For these families we would offer a 30% DISCOUNT for purchasing of one pound or more. Please call 303-465-3395 for information and ordering, as we do not have this discount listed on our site. It is hard to imagine that something else could happen to your once beautiful property and home. The fire has either taken everything or close to it, and now you must think about the soil and what to do with that. Erosion is probably one of the most important and common concerns after a wildfire. The severity will depend on many factors, like the fire itself, storm events, slope, and your soil type knowing that now the soil composition could be different then it was before the fire. Post fire erosion depends on many factors; however erosion hazard will increase as vegetative cover decreases. To be safe, just assume that all drainage in any steep or hilly area can carry debris fast downhill with moisture as the driver. A lot also depends on where you live, for instance if you live on or near a slope, or in a draw or a ravine or even along a stream or a river you need to be especially aware of the wild fire damage that is upstream or up sloped. If you find that all or most of the vegetation has been burned off in these areas, the chance for erosion is much greater and can result in mass movements of soil and left over debris downhill or downstream from its damaged area. For land owners over 6,000 FT, the best time for planting Wildflower Seeds would be late October or early November for the seeds to be ready for germination next Spring, not to be planted now because summer rains could wash all the seeds away or there is not enough time for the plants to reach maturity for survival during the winter.